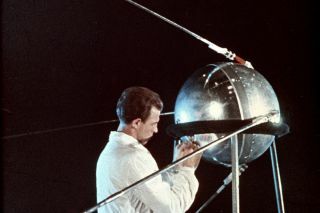 A Soviet technician works on Sputnik 1 before its launch in 1957. In October 1957, amateur radio operators monitored the first signal from a spacefaring civilization — and it was us. Sputnik 1, the first satellite to orbit the Earth, launched on Oct. 4 of that year from a site in Kazakhstan, then a part of the USSR. That site is now the Baikonur Cosmodrome; at the time it was site 1/5 at the Tyuratam range. What they launched had only a set of batteries, a transmitter and a pressure-activated switch that could tell ground controllers if the 23-inch (58 centimeter) diameter sphere was punctured by a micrometeoroid, Lewis said. The USSR had been planning satellite launches since January 1956, and the United States since 1955. Both countries planned for their first launches to take place during what had been dubbed the International Geophysical Year, which ran from July 1, 1957, to Dec. 31, 1958. Coincidentally, the IGY was intended to mark a new period of cooperation between the United States, the USSR and other nations. Neither planned launch announcement got much attention until the USSR launched Sputnik and surprised the world. "There was panic," Lewis said. "For the first time that harsh reality of the fear of nuclear weapons landing came to life. You were not going to have a warning of fleets of bombers." In the United States, the shock was in part driven by a belief in American technological superiority. On Oct. 4, 1957, the Soviet Union stunned the world with its surprise launch of Sputnik-1. Bille added that then-President Dwight Eisenhower was not a technically oriented person and was often baffled by the public's reaction to Sputnik. The U.S. already had a missile program and a fledgling space program, and Eisenhower saw them as going well. In fact, the U.S. launched the first intercontinental ballistic missile months before the USSR did. The Sputnik launch also drove Eisenhower to push for funding for science education at many levels, from grade school to college, via the National Defense Education Act, signed into law in 1958. Lewis said the country's experience in World War II had played a part in this — it was clear during the war that there weren't enough people with technical skills. Bille added that major publications, including U.S. News and World Report, had been lamenting the state of science education in the country, and Sputnik gave an additional push to improve. Bille said one reason the missile-gap concept had currency was that before satellite surveillance, few knew much about what was happening in the USSR at all. In that sense, Sputnik enabled satellite surveillance, Lewis said. Before the satellite's launch there was some debate over "open skies" — whether spacecraft could fly over the territory of other nations. Aircraft were barred from doing so. Sputnik, Lewis said, made the question moot, because Sputnik flew over the U.S. in the course of its orbit, and therefore U.S. satellites could fly over the Soviet Union. Even though the Soviets were unable to launch the more ambitious science payload, Lewis said that was part of Sputnik's enduring appeal. The satellite's beeps could be picked up by amateur radio operators; anyone could listen. That wouldn't have been the case for a true science instrument. Today, Sputnik's shape is in the logo of the Russian rocket company Energia, and it gave its name to the "Sputnik chandelier" design that became popular in the 1960s. And beyond its physical appeal, "there's a simplicity and beauty in being first," Lewis said. You can follow SPACE.com on Twitter @Spacedotcom. We're also on Facebook & Google+. Original article on Space.com.